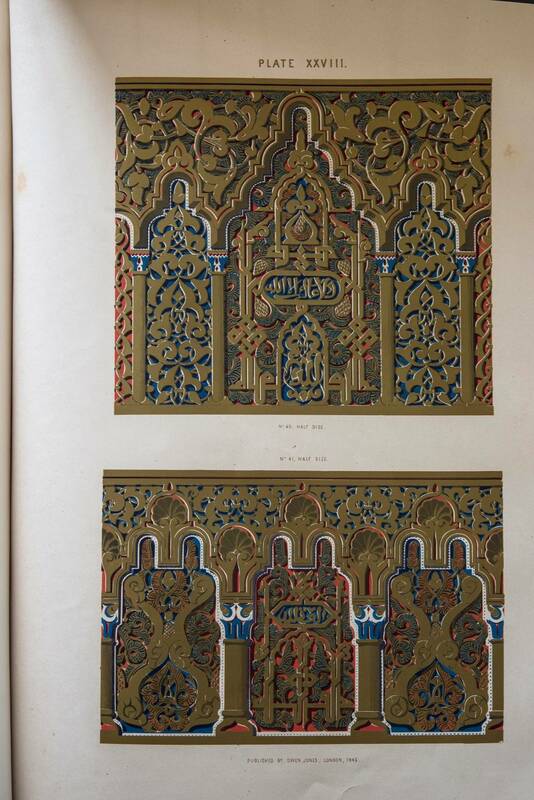 AA Library: Owen Jones – ‘Plans… of the Alhambra’. One of the most influential and well known designers in Victorian Britain, Owen Jones (1809-74) made a major contribution to the development of design theory and education. His architectural works include St. James’s Hall and Osler’s glassware showroom, and he worked on arranging exhibits and designing the interior decoration of the Crystal Palace. Jones initially encountered Islamic patterns and architecture during the grand tour he undertook after his architectural training in the early 1830s. 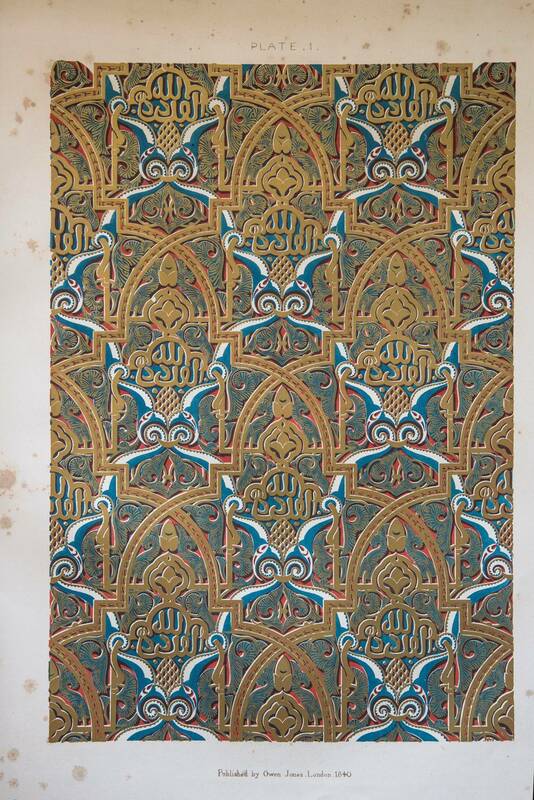 He and Jules Goury, a French architect, travelled to Egypt, Turkey, and Spain, following their interest in polychromy. On a visit to the Alhambra in Granada, Spain, in 1834, Jones and Goury decided to study and record the building and decoration of the palace. Goury died in 1834 of cholera but Jones continued with the study. On his return to England, he began the preparation of his first important work, Plans, Elevations, Sections and Details of the Alhambra. The illustrations in these beautifully produced volumes are the earliest examples of colour lithography in England. The first folio contains hundreds of illustrations, translations of Arabic script and an essay on the palace by Pasqual de Gayangos, a scholar of Spanish Arab civilization. The second volume, with fifty chromolithographic images of decorative fragments, was created to supply designers and manufacturers with ornamental details to study and copy. 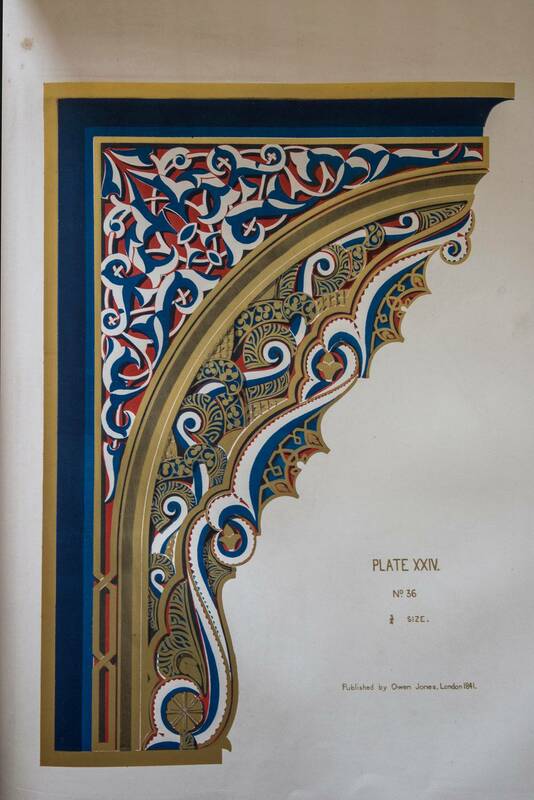 This publication established Jones’ reputation as an expert on Moorish art and architecture, and encouraged the use of polychromatic decoration in buildings. The book established Jones as a leading authority on historical ornament, further cemented by The Grammar of ornament, published in 1856. The Library copy of Plans, elevations, sections and details of the Alhambra, from drawings taken on the spot in 1834 has been in the AA’s ownership since at least 1939. A previous owner was the Highgate Literary & Scientific Institution, as indicated by their stamps on several of the pages.